Attwood, Jayarava (2018). 'Defining Vedanā: Through the Looking Glass.' Contemporary Buddhism, 18(3). The Buddhist technical term vedanā continues to elude just the right translation. Using semantic methods, scholars have argued both for and against the usual choices: “feelings” and “sensations”; as well as suggesting that phrases borrowed from psychology offer more semantic precision. In an attempt to break the deadlock and arrest the continuing search for the perfect translation, I argue that the term vedanā was not defined semantically. Instead, it was defined in the way that Humpty Dumpty defines words in Through the Looking Glass. Vedanā means what Buddhist say it means, neither more nor less, only because we say it does and not for any reason deriving from etymology or semantics. This observation leads me to conclude that methods from pragmatics, speech act theory, and cognitive linguistics offer better tools for analysing the term and settling on a translation. As I began writing, it soon became clear that another contributor had already gone over the semantic meaning of the term quite thoroughly, looking at the etymology and how the word is defined and used in texts. Since this was my usual modus operandi, I would have to be creative and I had just two weeks to come up with something. I began with some observations I had made about discontinuities between my modern worldview and the Iron Age worldview of the Pāli authors. I focussed especially on issues that have made translation of psychological terms difficult. This section stayed in the paper that I eventually submitted. However, it did not fill out a full-length article and most of it was not directly related to the problem of vedanā. So I had to think more about the problem of vedanā. The problem seems to be that although we Buddhists are all clear about what it means in practice (agreeable, disagreeable, and neutral feelings related to sense experience), we could not agree on how to translate it, which has been disagreeable. A number of suggestions have been adopted by different experts, but each is subject to criticism and debunking by different experts. This suggests that despite agreeing in practice, we somehow disagree in principle. This is a strange situation. No one is waiting around thinking, "If only the experts would agree on how to translate this word and we could get on with our Buddhist practice". Buddhist practice continues without hesitation, though, of course, we must all take time out to explain what we mean by vedanā. “The question is,” said Humpty Dumpty, “which is to be master–that’s all” (Carroll 1872: 112). In my article I noted that Alice represents a conservative semantics view. In this view, words mean what they mean and we cannot change that. In his book on the search for the perfect language, Umberto Eco shows that Europeans saw the perfect language as fixed and unchanging and that this idea was very influential. In this view, language has one and only one word per concept, and that relationship can never change. Meaning is relatively fixed. The problem is that this is not how languages work in practice. Synonyms and homonyms abound (and make poetry interesting). And words are constantly changing their meaning. 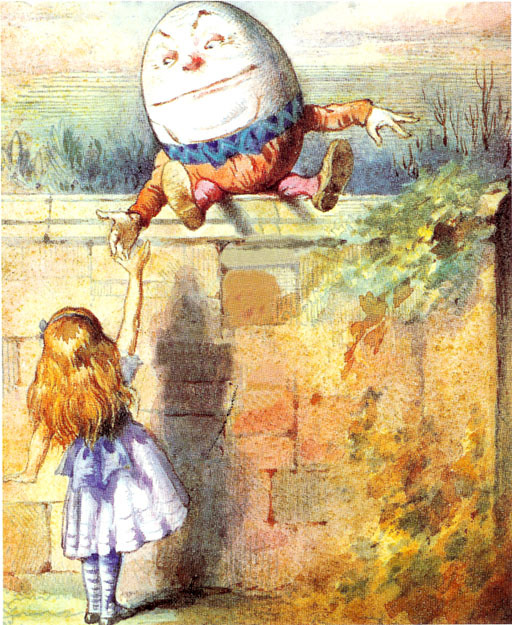 Humpty Dumpty, in contrast to Alice, is more of a linguistic pragmatist (albeit an anarchic one). He argues that means is not fixed and can be changed to suit the speaker. Alice can't know what he means until he tells her. It's quite likely that Lewis Carroll meant Humpty Dumpty to be a figure of fun and Alice to be the voice of reason. However, in use language is more like Humpty Dumpty's approach. In particular, if you look at the Pāḷi passages which define vedanā, they specify precisely that what it means. And, if we look closely, we can see that the Pāli authors are doing the same as Humpty Dumpty. Consider this passage from the Mahāvedalla Sutta (MN 43). A bhikkhu called Koṭṭhika is asking Sāriputta a series of questions about Buddhist jargon. It is important to note that Koṭṭika is a bhikkhu who seems unsure about the meaning of these common jargon terms. Apparently being conversant with Buddhist jargon was not always a criterion for ordination. Koṭṭhika: Vedanā vedanā’ti, āvuso, vuccati. Kittāvatā nu kho, āvuso, vedanāti vuccatī ti? K: "Feeling. Feeling" is said, friend. For what reason, friend, is the term "feeling" used? S: "It feels. It feels", friend, for that reason the term "feeling" is used. And what does it feel? It feels agreeable feelings, disagreeable feelings, and neutral feelings. This is not an exhaustive list of feelings that we have about sense experience, by any means. It is partial and pragmatically focussed on the aspects most relevant to the Buddhist approach to liberation from rebirth. More formally, what Humpty Dumpty and Sāriputta both do is perform a speech act. They make something happen using speech. In both cases, it is defining a word. In speech act theory we define locution (what is said), illocution (what is meant), and perlocution (what is heard). One of the classic performative speech acts used to occur in weddings. Before modern law changes, the marriage was sealed by the words "I pronounce you man and wife". Nowadays, of course, marriage is seen as a legal contract and it is not binding until both parties sign the written contract. Fairytales and other fictions often put the emphasis on the words "I do", but this is merely the consent for the priest to perform the final speech act. It was the priest who sealed the deal with "I pronounce you man and wife". Incidentally, "wife" is simply an Old English word (wif) meaning "woman" (it retains this sense in words like midwife and housewife). The word vedanā is a feminine noun derived from the past participle vedana. Contra the PED, the word is clearly used in the causative sense of, "made known". We can see this in the Sanskrit definitions of vedana as "announcement, proclamation". So we say vedanā, but in the Iron Age, even a bhikkhu (such as Koṭṭhika) might not know what we mean until we told them. Vedanā is the locution, but the illocution is far less broad. The illocution of the word is precisely: sukha, dukkha, and adukkhamasukha. The perlocution depends on whether or not one is familiar with Buddhist usage. Even if one spoke Pāḷi fluently, to hear vedanā would not be to think of sukha, dukkha, and adukkhamasukha. The etymology and use of related words both point to a meaning like "made known, a kind of announcement". So just as with Humpty Dumpty, no one knows what we mean by vedanā until we tell them. And once we tell them we expect them to adopt our definition. Semantic approaches to language do not cope well with this situation. In semantics, words have meanings and we can define those meanings through some relation to the world. In the Classical Pāṇinian Sanskrit worldview, most words can be defined as deriving from verbal roots (dhātu). The root, in this case, is √vid "to know, to find". It is being used in the causative voice, and the noun derives from the past participle. But this only gets us to the sense of, "announcement". We cannot reason semantically from vedanā to the meaning of sukha, dukkha, and adukkhamasukha. Things go from bad to worse when we argue about how to translate vedanā. Experts argue that this or that term is a better or worse semantic fit; i.e., that it conveys the sense of the word vedanā more or less accurately. Candidates include: feeling, sensation, feeling tone, hedonic tone, etc. Different experts argue that one or another term comes closest to the meaning of vedanā, and that the other terms all have serious drawbacks. And this is why, after more than a century of sustained interest in the Pāḷi language, we are no closer to an agreed translation of a basic technical term like vedanā. But think about it. None of these words comes remotely close to the sense of "agreeable, disagreeable, and neutral feelings related to sense experience". We don't have such a concept in Pāli, let alone in English. The candidate words do not convey this sense semantically because there is no relevant semantic field. If they do convey it at all, it is because we have performed a speech act to make it so. We still have to explain what we mean by "feeling", or "hedonic tone", or whatever. And vedanā is only one word amongst many in the Buddhist lexicon defined by the Humpty Dumpty method. The names of the other khandhas, for example. Saññā is a word that in general usage means "an agreement" or "a name". For a Brahmin of the Iron Age, a saṃskāra was a rite of passage. These rites involved karma or ritual acts of sacrifice. Doing the correct karma ensured that men got to Brahman after death. The early Buddhists redefined karma as cetanā—“an act of will” [that contributes to rebirth] (Cf. AN 6.63). But they retained the term saṃskāra (P. saṅkhāra) for a mental process that creates karma; i.e., a volitional or habitual response to sense contact. In other words, a saṅkhāra is an action that sets karma in motion. Khandha, itself, means "a branch", but is defined as a "heap" by Buddhists (See Pañca-skandha: Etymology and Dynamics). I suspect that the vast majority of Buddhist technical vocabulary is defined this way. Thus, seeking to translate it semantically is no help. We just need to get close, pick a term, and declare this to be the translation. However, this also raises the kinds of issues that John Searle dealt with in his later work, especially The Construction of Social Reality. For example, defining words is a function carried out only by qualified individuals. A function is not an intrinsic feature of an object. Some of us are qualified to define terms and others are not. Of those who are qualified, some have the authority, and some do not. A whole raft of contextual elements contributes to creating a situation in which everyone agrees that one person may function as a definer of words. I'm quite aware, for example, that few people consider me qualified to say the things I say. I do not have sufficient authority in their eyes to carry out the function I do. I'm merely impersonating an authority on Buddhism. So my opinions often count for little in the wider Buddhist world, whereas some obviously inferior minds do have the authority and control the opinions of thousands or even millions of people. Even when I have shown such people to be guilty of egregious errors, people do not switch their allegiance -- because, in the context of their lives, the function of Buddhist leader is vested in the person who fulfils particular criteria of which thinking straight is not one. A word like vedanā was defined according to the Humpty Dumpty method: by performative speech act. Vedanā means what it means because Buddhists tell us that is what it means. When words are defined according to the Humpty Dumpty method in the source language, there are no better or worse translations in the target language. Whatever word we choose means what it means because we say it does. No matter which word we settle on a translation, if we ever do settle, we will still have to explain what it means. And by explaining, we make it so. We are the masters of our vocabulary; our vocabulary is not the master of us. Therefore, “feeling” in the context of the khandhas means neither more nor less than, the agreeable, disagreeable, or neutral sensations arising from contact with a sense object. It means this because I—as an ordained Buddhist and published scholar—say it does; or it will if other Buddhists and/or scholars also say so. There’s glory for you!